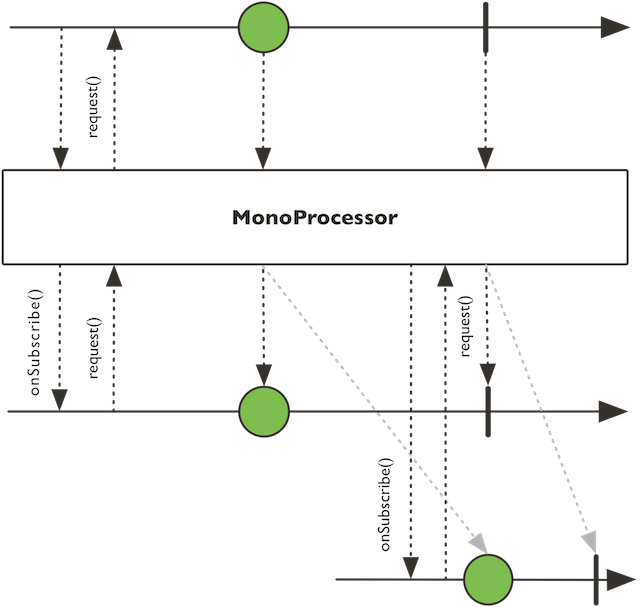 A MonoProcessor is a Mono extension that implements stateful semantics. Multi-subscribe is allowed. Once a MonoProcessor has been resolved, newer subscribers will benefit from the cached result. Block the calling thread indefinitely, waiting for the completion of this MonoProcessor. Block the calling thread for the specified time, waiting for the completion of this MonoProcessor. Create a MonoProcessor that will eagerly request 1 on onSubscribe(Subscription), cache and emit the eventual result for 1 or N subscribers. Request a Context from dependent components which can include downstream operators during subscribing or a terminal Subscriber. Cancel or dispose the underlying task or resource. Return the number of active Subscriber or -1 if untracked. Indicates whether this MonoProcessor has been interrupted via cancellation. Optionally return true when the resource or task is disposed. Indicates whether this MonoProcessor has been completed with an error. Indicates whether this MonoProcessor has been successfully completed a value. Indicates whether this MonoProcessor has been terminated by the source producer with a success or an error. Implementors should initialize any state used by Subscriber.onNext(Object) before calling Subscription.request(long). Returns the value that completed this MonoProcessor. This method is used internally by components to define their key-value mappings in a single place. An internal Publisher.subscribe(Subscriber) that will bypass Hooks.onLastOperator(Function) pointcut. Implementations are required to make this method idempotent. Block the calling thread indefinitely, waiting for the completion of this MonoProcessor. If the MonoProcessor is completed with an error a RuntimeException that wraps the error is thrown. Block the calling thread for the specified time, waiting for the completion of this MonoProcessor. If the MonoProcessor is completed with an error a RuntimeException that wraps the error is thrown. Returns the internal state as a long fulfilled. the internal state from -1 Cancelled to 5 errored, beyond 3 included is fulfilled. true if this MonoProcessor is cancelled, false otherwise. true if this MonoProcessor was completed with an error, false otherwise. true if this MonoProcessor is successful, false otherwise. Implementations are not required to track disposition and as such may never return true even when disposed. However, they MUST only return true when there's a guarantee the resource or task is disposed. true when there's a guarantee the resource or task is disposed. Implementors should initialize any state used by Subscriber.onNext(Object) before calling Subscription.request(long). Should further onNext related state modification occur, thread-safety will be required. Note that an invalid request <= 0 will not produce an onError and will simply be ignored or reported through a debug-enabled Logger. Returns the value that completed this MonoProcessor. Returns null if the MonoProcessor has not been completed. If the MonoProcessor is completed with an error a RuntimeException that wraps the error is thrown. In addition to behave as expected by Publisher.subscribe(Subscriber) in a controlled manner, it supports direct subscribe-time Context passing. This method is used internally by components to define their key-value mappings in a single place. Although it is ignoring the generic type of the Scannable.Attr key, implementors should take care to return values of the correct type, and return null if no specific value is available. For public consumption of attributes, prefer using Scannable.scan(Attr), which will return a typed value and fall back to the key's default if the component didn't define any mapping. key - a Scannable.Attr to resolve for the component. the value associated to the key for that specific component, or null if none.